Davie, Fla. – May 27th, 2015 – Dental Fix RX, a mobile dental equipment repair company, is proud to announce the signing of its most recent franchise, in Houston, Texas. It will be the company’s twentieth mobile repair van to launch in the State of Texas, and is part of an aggressive North American expansion plan calling for 500 all-new vans to be launched over the next five years. Davie, Fla. – May 26th, 2015 – Dental Fix RX, a mobile dental equipment repair company, is proud to announce the signing of its most recent franchise, in Conyers, Georgia. Owned and operated by Bryan Sigur, it will be the company’s sixth mobile repair van to launch in the State of Georgia, and is part of an aggressive North American expansion plan calling for 500 all-new vans to be launched over the next five years. Is it time to retire your dental ultrasonic cleaner? Prepare your dental ultrasonic cleaner for the foil test: fill it to the “max” line mark, add a small amount of detergent to soften the water. Set the heater thermostat to 140 degrees F. or heat water in a kettle if your dental ultrasonic cleaner doesn’t have a heater. Run your dental ultrasonic cleaner on a cleaning cycle for ten minutes, since this combined with the heated water will expel the air in the solution to allow your dental ultrasonic cleaner to function optimally. Using a piece of aluminumfoil large enough to be immersed diagonally into your dental ultrasonic cleaner, run a cleaning cycle for an additional ten minutes while holding the foil close to the bottom of the dental ultrasonic cleaner. When the cycle is complete, remove the foil and inspect it for evidence of indentations or shreds in the foil, depending on the wattage of your dental ultrasonic cleaner. If you do not observe any such indentations, you can positively say that you need to replace or repair your dental ultrasonic cleaner. Dental chair equipment can be seen as the heart of a dental practice. It’s where patients get dental procedures done, and improperly functioning dental chair equipment can be a nightmare for both dentists and dental assistants. In addition to scheduling regular preventative maintenance checkups with your preferred dental chair equipment repair technicians, there are things you and your staff can do to ensure that you’re caring for your dental chair equipment. At the beginning and end of each day, there should be a routine in place for checking and cleaning dental chair equipment. Filling and checking that self-contained water bottles have the right amount of water can mean the difference between proper and improper functioning of dental chair equipment. During the day staff should also keep an eye on water levels to keep dental chair equipment functioning at their optimal level. At the end of every day, suction cleaner should be run through the saliva ejector tubings and operatory HVE, and delivery unit traps should be cleaned or replaced if necessary, ensuring proper functionality of dental chair equipment the following day. To ensure that dental chair equipment is functioning properly and conduct routine self-maintenance, your staff should have a kit containing everything needed for upkeep on dental chair equipment. This kit should include air compressor oil, intake valves, vacuum intake filters, traps and canisters, spare O-rings and gaskets, as well as line cleaner. Paying attention to unusual discoloration, abnormal or loud noises emanating from dental chair equipment is important as well, so that you can consult professional technicians. Davie, Fla. – May 10th, 2015 – Dental Fix RX, a mobile dental equipment repair franchise company, now provides regular services to more than 11,000 dentist offices across the U.S., Canada and Mexico. The announcement comes less than three months after the franchise business broke the 10,000 customer mark and less than six years after its initial founding. “2014 was a record breaking year for Dental Fix RX. We opened 75 all-new franchise territories throughout North America, including Mexico and Canada,” said David Lopez, CEO of Dental Fix RX. “Now that we are serving more than 11,000 dental customers company wide, it is safe to say we are moving increasingly closer to our overall goal of dominating the North American dental service industry.”Following its founding in 2009, Dental Fix RX launched its first franchise operators in 2010. By the end of 2012, the franchise company was operating mobile repair vans in approximately 20 U.S. markets and servicing nearly 1,700 customers. One year later, Dental Fix’s customer base nearly doubled and by the end of the third quarter of 2014, the franchise continued to increase by surpassing 8,000 customers only to break the 10,000 mark in early February, 2015. Dental handpieces can be considered to be the core of any dental practice, and failure to engage in proper dental handpiece maintenance can be detrimental. If your handpieces aren’t functioning properly, you can run into a host of problems that could have been prevented with regular dental handpiece maintenance. This article provides you with 4 reasons to keep up with your dental handpiece maintenance schedule. Dental handpieces could possibly be the most used tool in every dentist’s practice, so naturally there will be wear and tear associated with constant daily use. Scheduling regular dental handpiece maintenance can help prolong the life of your handpieces and ensure quality dental work for your patients. Regularly lubricating and purging your dental handpiece systems should be an integral part of your dental handpiece maintenance You and your staff can ensure that your dental handpieces are in top condition and prevent failure by following manufacturer’s directions for cleaning and sterilization. Dental handpiece maintenance involves realizing that the problem may need to be addressed by a professional. You should schedule dental handpiece maintenance with your preferred company since ignoring the issue could lead to loss of productivity and money when you find yourself having to purchase new dental handpieces. You may be tempted to disassemble the handpiece if you think there’s an internal problem, but this is strongly advised against unless you’ve had training in dental handpiece maintenance and repair. Instead, be sure to inform your preferred company so they can assist you with dental handpiece maintenance. Gary McHale of Buffalo is one of two Dental Fix RX franchisees in Western New York. McHale rides around from dentist to dentist in a state-of-the-art white van, making daily stops in Rochester, and fixing hand pieces, chairs, compressors, and X-Ray systems among other things. Dental Fix RX is a national mobile dental repair company and its slogan “The Faster Fix” is splashed in paint across the side of the van. “Most companies are going to take the hand piece and send it away to a repair shop and so they’re looking at two to four days at least, shipping, repair time, getting it back, and transportation time. We can fix it the same day,” McHale says. And he does just that, sitting right outside in the dentist’s parking lot. If he doesn’t have a particular part in stock, McHale says he can have it shipped to him overnight. Perhaps what most intrigues customers is that Dental Fix RX is less expensive than most other dental maintenance and repair options. Typically it costs around $300 to $400 for most repairs, with prices increasing for more elaborate work. Of course, this cheaper fix helps the dentists with their bottom line. Keeping more money in their pockets enables these professionals to expand their business opportunities and open up new revenue streams. When McHale’s mobile business launched in April, Dr. William Leicht at Oak Orchard Medical in Brockport, New York didn’t hesitate to give his services a try. 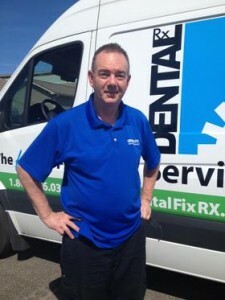 Dental Fix RX franchise owner, Gary McHale, provides Rochester area dentists with prompt, on-site equipment service and repair. “You’re using one [hand piece] on every single patient. Each dentist probably has four hand pieces, because they’re constantly getting autoclaved in between patients. With the wear and tear on them, they need maintenance on a regular basis,” Leicht says. Dental Fix RX was founded back in 2009 and now has nearly 200 franchisees providing service to dentist offices across the United States, Canada and Mexico. After working for more than a decade as an executive in the gaming industry, McHale might seem as though he is now out of his element. But it’s his passion for tinkering and years spent as a carpenter and electrician that led him to this unique opportunity. The challenge, for now, is getting his brand new business off the ground. And if it grows the way he thinks it will, McHale plans to bring one or two employees along for the ride. “This is not a get rich quick scheme, which I like. It’s challenging. There’s been some times where I’ve had to go door to door with my little tin cup and knock on the door and say ‘Hey would you like someone to fix your dental equipment for you?’ But it’s fun,” he adds.